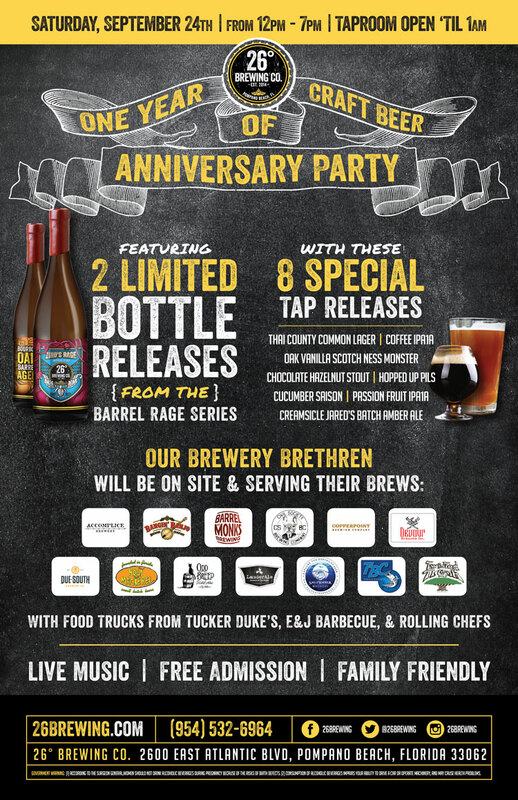 At the party, we’ll be offering two Ziko’s Rage limited bottle releases from the Barrel Rage series — Bourbon Barrel Aged and Cabernet Barrel Aged. While the roasted, chocolaty flavors of the imperial stout are prevalent in both beers, the Bourbon Barrel Aged boasts bold notes of smoke and oak, while the Cabernet Barrel Aged is infused with the captivatingly subtle sweetness of red wine. At 8% ABV, both of these brews are to be sipped and savored. Partygoers will also be able to enjoy eight special tap releases, which include Thai County Common Lager, Coffee IPA1A, Dark Vanilla Scotch Ness Monster, Chocolate Hazelnut Stout, Hopped Up Pils, Cucumber Saison, Passion Fruit IPA1A, and Creamsicle Jared’s Batch Amber Ale. In addition to these exclusive craft beers from 26° Brewery, a number of the country’s most beloved breweries are bringing out some of their best brews to celebrate with us. Tucker Duke’s, E&J Barbecue, and Rolling Chefs will be providing food truck fare. With succulent food, live music, and free admission, there’s no reason not to bring the family.